I grew up as the daughter of two pharmacists. I was well versed in the “here, take this” modality of medicine. When folks are used to this approach, it can be difficult, as integrative practitioners, to introduce the multitude of modalities that are needed to comprehensively care for our patients’ clinical presentation. Dietary modifications, lifestyle interventions, botanical therapies, and clinical nutrients at proper and perhaps divided dosages can seem like a whopping, overwhelming plan, ripe for derailment in the compliance/adherence department. There is a slight difference between compliance and adherence, which I think is profound. Compliance means the patient simply did what I told them to do, often leading to short-term success, yet no real change or ownership of the process. Whereas true adherence is when there is a faithful attachment to the plan by the patient. They get it. They understand. There is solid rationale behind my suggestions and they know it and are on board because they know it makes sense and they are in it for the long haul of healing. A few years ago, I came up with an “accounting” system that turned out to be a tremendous tool in fostering adherence. 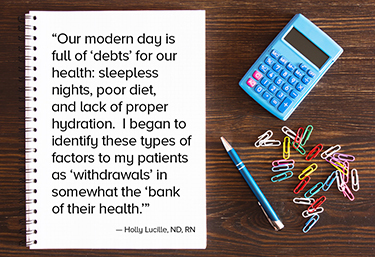 Let’s face it; most people who present at my clinic are somewhat “in debt” with their health. They either have symptoms getting their attention, lab work that is pointing to a process happening in their body, or a combination of both. While getting to know more about them through the intake process, I start to note things that might have contributed to this “debt.” Our modern day is full of them. Sleepless nights, chronic and confounded stressors, poor diet, lack of proper hydration, relationship issues, and dependencies on substances such as caffeine, alcohol, and prescription medication. I began to identify these types of factors to my patients as “withdrawals” in somewhat the “bank of their health.” In turn, I identified my many recommendations, comprehensive indeed, as “deposits.” The counseling continued with the financial analogy reminding them that the way to get out of debt, over time, is to simply make more deposits, than withdrawals. Voila! This framing allows my patients to be more “accountable” for their health and adherence. It allows for the automatic withdrawals that are proliferative in these times, yet fosters awareness and action on making the deposits and mitigating the withdrawals, once identified. It also allows for time and patience for healing, without the sense of failure. When aware, people know they will get out of debt quicker if the balance sheet is in favor of deposits and as well, they can hang out in the red, not bankrupt yet, knowing they have resources and a plan if they get behind.